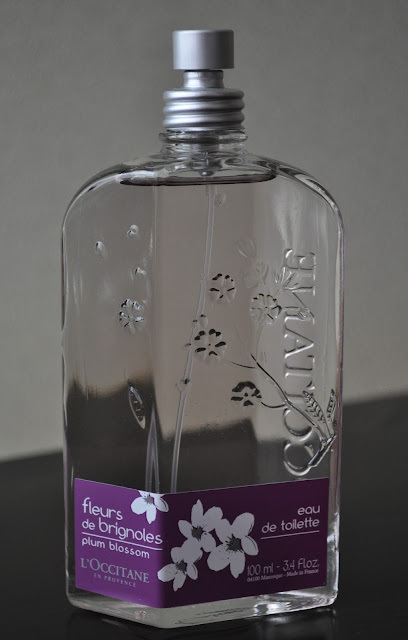 Regrettably, I'm going to share with you, a fragrance that I've fallen out of favor with, and that fragrance is L'Occintane's Eau de Toilette in Plum Blossom. L'Occintane describes Plum Blossom as a "vibrant, floral fragrance that combines the delicate powdery scent of white blossoms with the fruity sweetness of plum fruits, which fill the air with a liqueur-like scent, with hints of bitter almonds". Although I agree with L'Occintane's description, I find Plum Blossom to be too sweet, powdery and the floral scent overbearing. As you can see in the photo, I really haven't given this Eau de Toilette much love ( I was trying to use up other perfumes at the time), but I did like this fragrance when I purchased it a year ago. The other day, I put Plum Blossom on and after 20 minutes of wear, I had to take another shower to wash it off, since it was giving me a headache. I guess my sense of smell has changed in the past year. Have you ever fallen out of favor with a fragrance before? yes, i totally have. i used to be completely in love with chanel, i cant stand it now, i am currently enjoying versace red jean woman. Red Jeans used to be a fav of mine in high school :) My have to buy a bottle! Although some scents have fallen out of favour with me, I was unaware until now that one might get on a scent's bad side. Thanks for the heads up! smh.